There are many different places you can advertise your book. Goodreads advertising space, Google ad words, Facebook and many small independent blogs and book sites. So why did I choose Facebook? OK, you got me. I had a free $50 voucher for Facebook advertising that I recieved when I signed up with my hosting company! Seemed a shame not to use it. Facebook ads are small and short. You need something to grab your reader, and encourage them to click on your link. A photo is important, make sure it's the exact dimensions that Facebook specifies, so you don't waste any space, or have anything cut off. 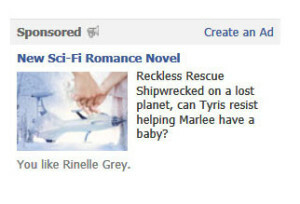 Since Facebook ads are landscape, your book cover probably won't be suitable. I used the same images though, to give the same feel. You have 90 characters to go with your picture (including spaces), so you need to make them count. A short phrase is all you can get. Here's my ad for Reckless Rescue. I'm pretty happy with how it turned out. I was blown away by the amount of options you had when targeting your ads! You could choose locations, language, age ranges, gender, single/married/relationship, education etc. Then you could select both broad categories, and specific tags for your ad. I tried to make my range as large as I could, while still choosing options that I thought would put my ad in front of the people most likely to click on it! I set my budget for $5 a day, meaning my $50 would last for 10 days. You pay small amounts for the number of views, and slightly more per click. Facebook seems to spread this out over the day, so you won't run out of money half way through the day, the only difference, I guess, is how many times your ad is displayed througout the day. Come on, get to the point – Did it Work? Well, that depends on what you're hoping to achieve out of it. Did I have hundreds of people buying my book all of a sudden? I wish! No. What I did get was more likes on my facebook page. I started out with 22 likes – mostly friends and family. By the end of the 10 days, I had 241 likes! I was pretty happy with that increase. 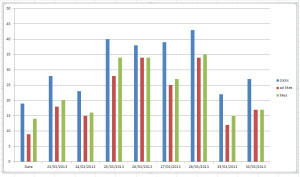 In case you're new to my blog, I love stats and graphs, so as much as anything, I really enjoyed watching the line go up on this graph, it certainly made me feel productive. 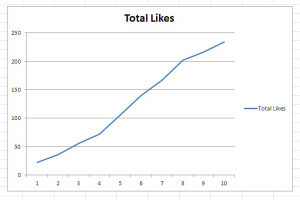 One thing I found really interesting was that the increase in likes was higher than the likes Facebook recorded through direct clicks. You can see here, the blue bars are the ad clicks, the red bars are the likes Facebook recorded, and the green bars are the actual extra numbers of likes I had. I can only assume that this is because other people see their friends liking a page, and check it out too? How does it sell books though? It's hard to tell if this sold any books at all (no sales were directly recorded as a result of the clicks), but it did get my books cover and blurb in front of 200 new people! What forms of advertising have you tried? Any you'd recomend? Do you click on ads, and if so, what inspires you to click? All this month I’m participating in the A-Z blogging challenge, writing a blog post for each letter of the alphabet, on every day of the month except Sundays. Check back regularly to see what else I have in store for you. Hi Rinelle. Really well thought out and interesting post. I work for a video production company and we tried FB advertising for a while – and you’re right, it’s great for increasing the number of likes on your page. I think if you view it simply as a way to increase awareness of your book/brand then it can be very effective – especially when you really refine your target audience. Thanks for sharing. Thanks for sharing your experience. Yes, I think it all comes down to how you look at it. It was a success for getting more likes. Now I just need to figure out how to turn those likes into customers, or at least people who share the content with their friends. That’s my next lesson. Hi Rinelle, I tried FB advertising recently to promote the launch of my newest book. I used it to draw people’s attention to the event page which worked in terms of increasing those joining the launch party (and also a few extra likes of my author page) but it didn’t seem to increase sales. Also, a the profiles of a few of the people who joined seemed ‘fake’…did that happen to you? Promoting the launch of a book sounds like a great use for Facebook ads. Glad it was successful for you. I didn’t notice any profiles that looked fake, but I haven’t scrutinized each and every one. I wonder, did you offer a prize or some sort of incentive for people to like your page? I think that would definitely increase the number of fake sign ups you would get. Interesting experience. I’ve heard FB is very targeted, and I’d count it as a success even if you didn’t sell any books. Yes, I was impressed how targeted the options were. Makes it easier to put your ad in front of the people who are most likely to appreciate it. I don’t know if $50 is worth 200 Likes to me, especially in a world of six- and seven-digit Liked pages. For free, I’d definitely take such an ad! Though they are very tricky, as you point out. You have to hook fast. I barely ever click on them. Ahh, but how do you think they got those six and seven figure likes? Lol, that’s probably a bit unfair. I do know several sites that have earned them fair and square by offering great content that people want to share. But how to do that as an author? I’m not sure. At this point, I haven’t really spent any actual money on advertising, so I can’t say whether it would be worth actually doing so. But I do know that having those 200 likes is making me think more seriously about my Facebook page, and how I can best use it. Thanks for sharing your experience with FB ads. I’ve been toying with that idea for a while. I used a book promotion company to advertise my book for several weeks.. I don’t think it generated a lot more sales, but I did get a few more reviews on my Amazon page. I think I’ll give the FB ads a try next. Good luck Sherri. I hope you get some likes, and even better, some sales! A very interesting post. I’m an artist who writes a little bit so I’m not very knowledgeable about the book publishing experience but as a fellow creative I found your story fascinating. I didn’t realize Facebook was such fertile ground for advertising but I should have known. I didn’t expect that sort of response either. As someone who rarely clicks on ads, I thought I might be lucky to make 30 or 40 likes. 200 was way above my expectations! Interesting. I’ve been thinking about running a Facebook ad to garner some interest in one of my perma-free books, but I’m not sure how to go about doing it (or whether it would be worth it at all). I figure if it’s free, it’s easier to get people to click, but from what I’ve heard here and elsewhere, Facebook ads aren’t that great at producing results outside of the Facebook ecoysystem. I don’t know, though–maybe it’s worth a shot. What do you think? I’m curious about that myself – if it would be easier to promote a free book. However, not sure about the benefits of paying to promote a free book either? I think it depends what your goals are. I did see lots of facebook likes from my ad, but not much else (that I can say for certain). The problem with determining the effectiveness of any campaign is that it’s difficult to tell where your clicks/sales are coming from. I’m glad you shared that. This is just the kind of info I visit blogs to find out. That was some great information. Thanks. I didn’t even know it existed. There is so much to learn. There certainly is. I’ve learnt so much in the last 12 months, and I’m sure I still have lots more to learn! 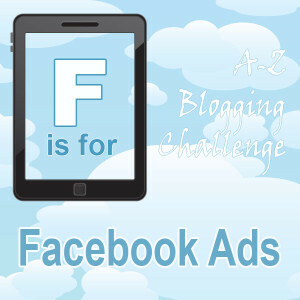 Thanks for sharing about Facebook Ads. I’ll be sure to look into that option if I ever want to go down the route of self publishing. Hi Marjorie. Thanks for visiting and commenting. Self-publishing is lots of fun, but good luck with whatever option you choose.